I probably changed the title of this blog at least five times. I wanted the title to encompass the meat of the blog which as you will see is that anyone can do something if they really want to. One of my dear friends texted me after Ironman Arizona and asked for me to share for the aspiring athlete, that person that sees the Ironman and thinks I want to do something like that but immediately says there is no way I could due to this or that. So, as we move into 2017, a whole new year of dreams and goals to be achieved, it's a great time to think about those dreams and begin making them a reality. To help make that move from maybe to going for it I wanted to share a little bit of my thoughts on some of the hesitations that people often have. We've all had that dream we've wanted to accomplish but let something stand in our way. 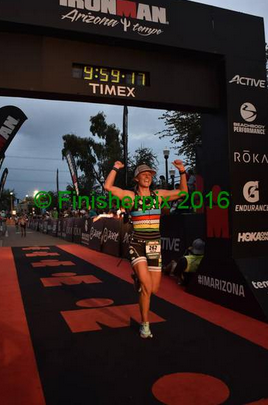 As I journeyed down the path towards Ironman Arizona more and more I would here the same comments from people asking me what I was training for; I would love to do something like that but there is no way I could. How do you have the motivation? I started to notice a pattern, that there are many people who have the dream or aspiration to train for something like a triathlon. Training for a triathlon does take a lot of time as there is a lot that goes into training for one, no matter what the distance you choose to do. There is the training of three different disciplines, practicing your nutrition for training and race days, your daily nutrition which often includes meal prepping (to help save time), and even planning for your rest days. There is no way to get around the time it takes to train for a triathlon. However the key, and this is something you will hear me say a lot, is how much do you want it? If you want it you will make the time. For example: Say you really want to get your master's degree once you take the leap towards getting it are you going to let time get in your way? No, you are going to make the time to study and to go to class. You've paid the money, you've invested your heart into it because it is something you want. Training for a triathlon is fundamentally the same. If its something that you really want you make the time. Maybe that means you get up an hour earlier, utilize your lunch break at work, wait until the kids are asleep then get your ride in on the trainer. Making time can be scary as it seems like then you are taking up any free time that you may have. Truthfully this may be the case but to be a broken record it all comes down to how much do you want it, when you really want something and have put your heart and soul into it you won't let it stand in your way. That "free time" that you had previously becomes slotted for your training because you want it to. As mentioned above sometimes you have to make the time and this can mean that you find any free time that you have to utilize. So where does that leave your social life? The ability to balance triathlon training and your social or family life gets more challenging as the distance of triathlon increases, due to the amount of time you spend training increasing. The balancing act is learning to pick and chose between training and life. You can have both, I promise. This past year I worked 40-50 hours a week, trained for Ironman and still found time to spend time with my husband, golf with my parents, and vacation in Mexico. Yes, there were plenty of times in which I had to go home early from drinks with friends because I had a long workout the next day, or even say no to something because of the workout I had to either get done that day or the next. When planning undertaking the triathlon journey, especially the Ironman journey, you have to be transparent with your family and friends in regards to the actions you are taking. Being transparent helps them to understand what it is that you are doing, they may not always understand but it helps. The important thing is to not let it get in the way of your life, if you always say no I can't do that I'm training you risk the chance of people stopping to ask you to do things. Make compromises; if they want to go for drinks but you don't want to be out late arrange a coffee date, or go for an hour so that you are still there. Plan meet ups on your rest day, it will also help you to prevent yourself from going crazy on your rest day. Sometimes you it just comes down to making changes in your train; get your workout done earlier, stay up later, or change your rest days around. You've decided to battle the time and balancing of social life, so how to get started? I always recommend picking a race you want to do and sign up for it, put your money where your mouth is. Once you've paid for it helps to put the date on the calendar, gives you the end mark, and motivates you as you've spent the money no point in wasting it. It can be scary embarking on the triathlon adventure on your own, but don't worry the triathlon community is an amazing one and you will be fully welcomed. Don't be afraid to reach out to people who are experienced and get their advice. Now a days social media allows us to be in communication with people from all over the world and in the triathlon world most are willing to help you get started. We all remember the first triathlon we signed up for and then blundered our way through. One of the great things about triathlons is that you are always learning, always growing, and forever changing so it doesn't matter if you are a first timer or pro we can always learn from one another. I promise you there is always someone who will help. Honestly triathlons are terrifying, they force you to step out of your comfort zone time and time again. Even if you are comfortable with all three disciplines one is still usually harder than the other three that will make you step outside your comfort zone. Almost a year ago I wrote a post titled "15 seconds of courage You know, sometimes all you need is twenty seconds of insane courage. Just literally twenty seconds of just embarrassing bravery. And I promise you, something great will come of it.” That is all the triathlon journey is, multiple sets of 15 seconds of courage. Everyone is a little bit different at what it is that scares them when it comes to the disciplines though what you hear the most often is that swimming is the most concerning. The key to remember when thinking about swimming is it is the least amount of time you are doing something during a triathlon. Take Ironman for example the swim is 2.4 miles long and will take somewhere around an hour twenty to an hour forty for most people, compared to the bike which is 112 miles long and will take anywhere from six to nine hours to complete. You can spend eight hours on a bike you can for sure spend a little over an hour swimming. When there is a discipline that scares you a little bit or you don't feel as comfortable doing then spend a little bit more time training for that one. They always say practice makes perfect, it also brings comfort. The more that you do something the more comfortable you will feel doing it. Don't be afraid to step out of your comfort zone a little bit as the more you do the less uncomfortable it will be. This can be one the hardest parts of training, for anything, but especially for an Ironman. Your Ironman journey can be anywhere from 6-9 months from when you start training till the race day. This can be tough because you are putting all this time and effort into something that is a long ways off. Always remember your end goal, the dream. You started this journey because you had a dream. Keep that dream in the back of your mind the whole time as it helps to motivate you. Spend time picturing that end, picturing yourself crossing the finish line and the feeling that you imagine you will have. It helps to keep that dream alive. People always ask why do you do Ironman? Its a feeling. There is this strength and power that erupts from you the moment you cross the finish line; a completely raw, real and powerful feeling that enters your soul and runs through your blood forever. Set mini goals for yourself during your training and don't forget to celebrate those. Celebrate that moment you hit your first 100 mile ride, or your fastest ride ever, that moment you swim the longest you've swam, or you got yourself up early every morning. It's the celebration of the little moments that help to make the journey seem less long and more forgiving. Triathlon is not a cheap sport, it really isn't. However, you don't have to spend all the money to have do well and have fun while doing it. The first couple triathlons I ever did I did in a sport bra and shorts, tennis shoes, and my mom's old bike. I believe I spent a total of 100 dollars including the entry fees. Yes, the new gear makes a huge difference and as you grow with the sport your gear can grow as well but you don't need to let it stop you from chasing a dream. You could write for hours on diet and still never get it right as it is different for everyone. Not one person has the diet piece of training nailed down and something that may work for someone may not work for someone else. However, diet is a really important aspect to triathlon training. You have to fuel your body properly in order for it to perform to the standard you are asking it to do during a triathlon, especially an Ironman. Your body is a like a car you put "good stuff" into it and it will run better. Do you have to spend hours and hours meal prepping each week for your Ironman training? No. Do you have to count your calories, track your macros, and never eat bad things? No. Should you eat healthy and fuel your body with proper nutrition? Of course. You should be doing this on a normal basis anyways even if you aren't training for anything. Figuring out what works best for you nutrition wise both during and not during training for an Ironman takes a lot of time. It can even take a lot of trial and error. It takes listening to what others have tried what they learned from it and trying something that you think will work for you and learning when it doesn't. The triathlon journey can be long but it is also very rewarding and in the end you aren't choosing to do a race you are choosing to learn a lot about the strength and power that resides inside you. Don't be afraid to go after your dreams, if it is something you've always wanted then go for it because your dreams won't work unless you do. If you have more questions don't hesitate to reach out, this is a passion of mine and I enjoy helping others find their passion as well.